After installing the Donate Bar select Donate Bar > Settings. Only check the PayPal Sandbox box if you are testing the plugin with a PayPal developer account. Add your PayPal email address, the API user name, API Password, and API signature. If you are not sure where to find this information here are further instructions. Change the description that the user sees on the PayPal payment screen. 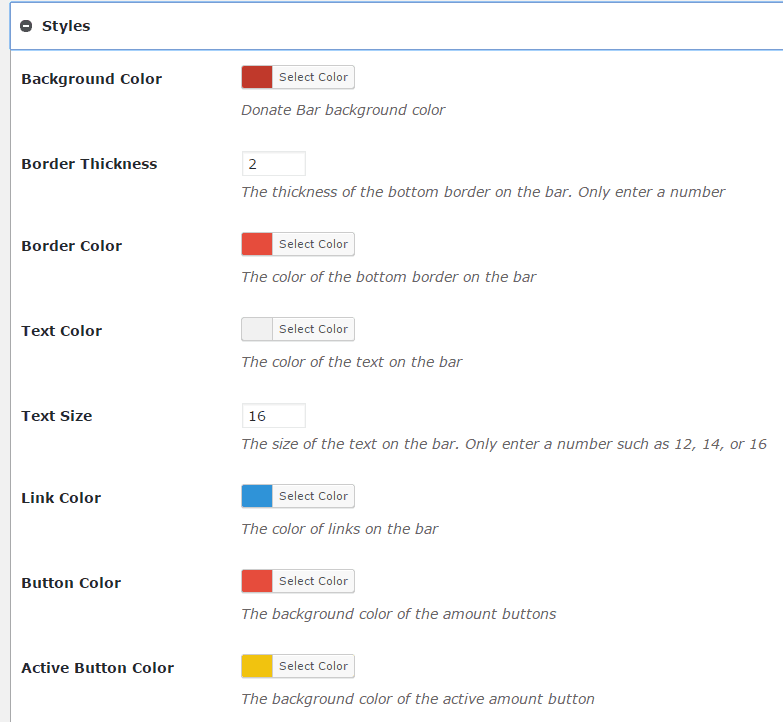 The colors, text size, and border thickness can be changed in the styles settings. To enable the Donate Bar to show on the front of your website check the active button. The delay is the amount of time in milliseconds that will go by before the donate bar will show on a page. The speed is how fast the Donate Bar will slide down in milliseconds. Type your compelling message in the box. Check or uncheck if you do or don't want to show the Donate Bar on mobile devices. Then add a special compelling message for mobile devices only. If the value is 0 the button text will show other. Other allows givers to enter an amount once they reach Paypal. If the field is left blank no button will show for the field.